Seal on the beach in Nags Head. 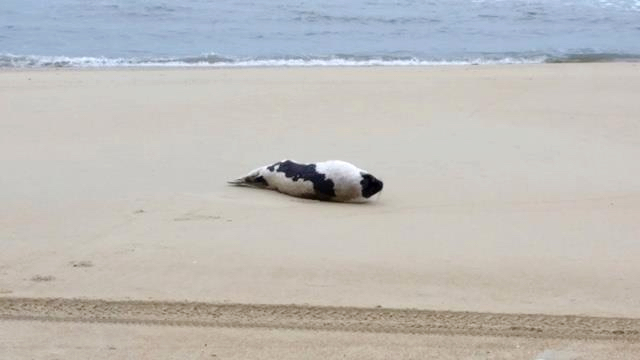 Yes, that is a seal on the Nags Head beach. There’s not a lot of them, but surprisingly, every winter a few seal do stop by the Outer Banks. For the most part they’re harbor seals, although an occasional gray seal is also spotted. They seem to be following colder ocean water temperatures, as a 2015 Cape Hatteras National Seashore study noted. When seen on the beach, they are usually resting. It’s almost unheard of for a colony to take up residence along an exposed beach on the Outer Banks. During the winter months, however, there are small colonies that inhabit some of the islands in Outer Banks sounds, especially Pamlico Sound. About a half mile south of Oregon Inlet, Green Island is a wetlands patch of grass and sand that seem to be a favorite resting spot of seals. The 2015 Summary pointed to Green Island as a particularly good good belle weather for seal activity. “Historically, the south end of Green Island has been used by Harbor seals as a haul-out site for consecutive years, therefore a sighting doesn’t necessarily imply one individual; the most observed at one time in 2015 was 2 but up to 33 seals have previously been observed,” the study’s authors wrote. There are concerns that construction noise and activity as the new Bonner Bridge is being built will scare seals away, but there is some uncertainty about that. Although a seal on the beach may look cute, it is important to leave it alone. It is Federally protected under the Marine Mammals Protection Act so approaching it is illegal. Beyond that, seals are wild animals and they weigh 200-250 pounds. If there is concern that the seal is injured or sick, contact N.E.S.T. (Network for Endangered Sea Turtles) at 252.441.8622.